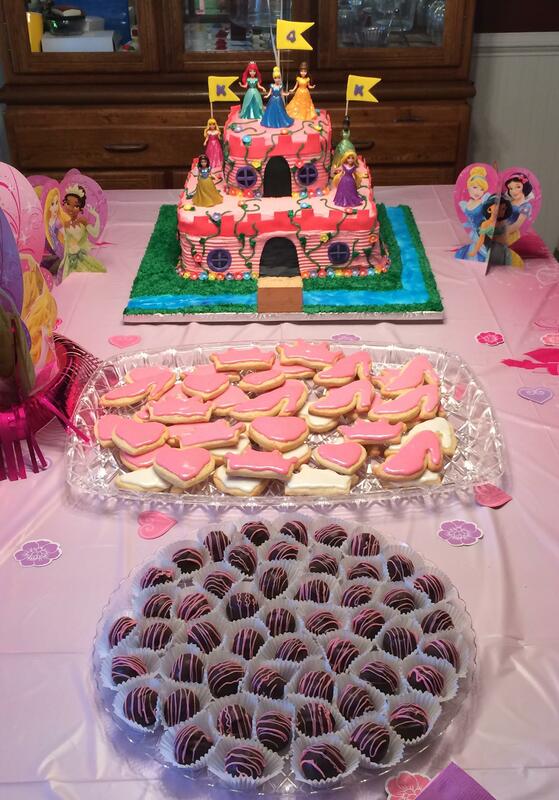 Over the weekend, we threw a birthday party for our daughter. It’s still hard to believe she’s already four years old. 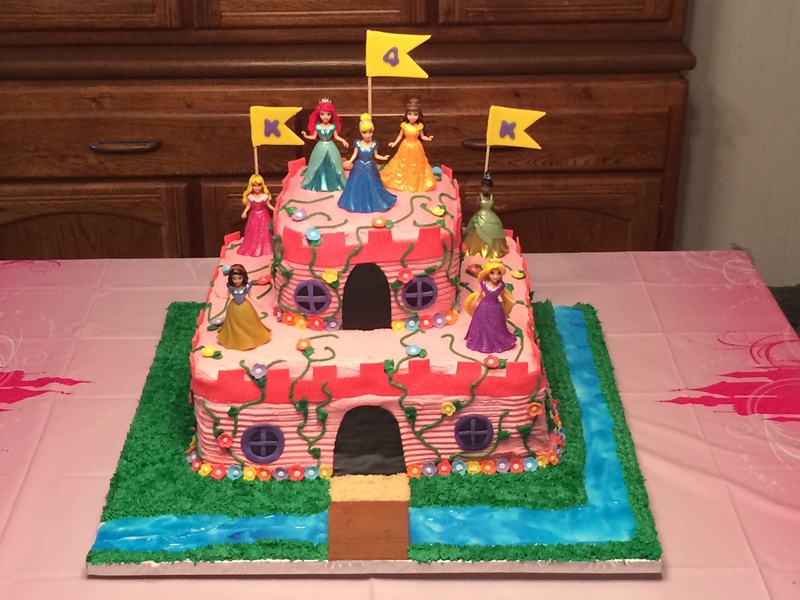 Anyway, several months ago I had asked her what kind of cake and party she wanted, and since she’s really into princesses, this was naturally the theme she picked. So, I started thinking, and asked, “Do you want a princess castle cake?” Her eyes lit up and she cried, “Yes! 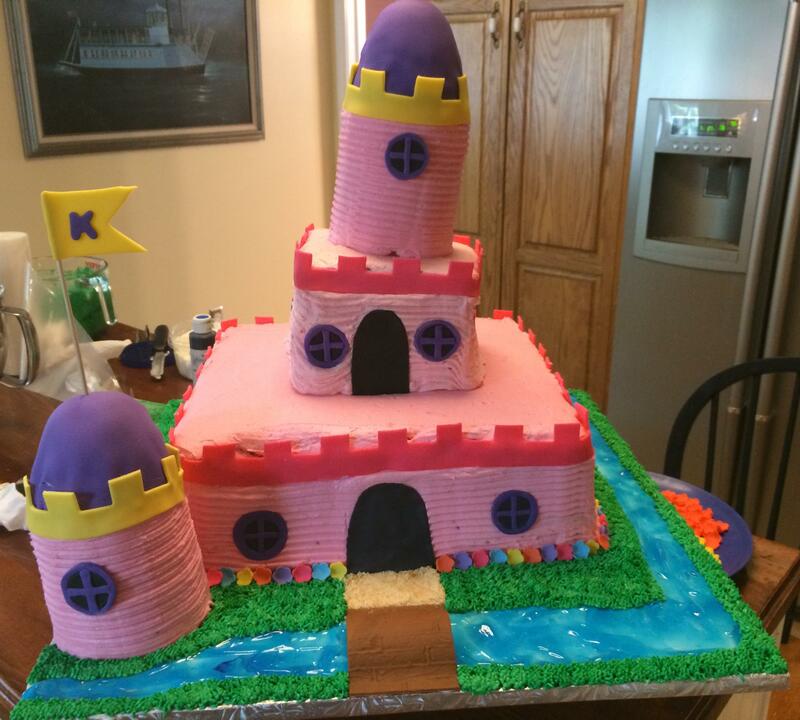 A pink princess castle cake! !” Done. While constructing the image in my head, the idea of towers sounded wonderful. But, with graduating from culinary school the week before and forty million other things going on, I wasn’t able to pre-make any of the towers. I attempted to make some thicker towers, but half of them didn’t turn out well and were leaning quite terribly. The first picture here is a rough draft of the cake. I liked to call this the Leaning Tower of Pisa. I thought it was appropriate. Anyway, the lopsidedness of this cake had me all up in shambles, and I couldn’t handle showing off a cake like this. The middle tier was the lopsided part, but after it was all put together and the icing was too soft (it was ridiculously falling down on the sides), I decided to redo that part and go with it. Even though my daughter loved it, I was already making excuses in my head as to explaining why we couldn’t take the cake out to the porch for everyone to sing happy birthday so she could blow out the candles. Plus, I knew that sleep from massive anxiety of my perfectionism would really get in the way and practically ruin the whole ordeal. No, I’m not kidding. So, off went the two towers and middle tier…and into the trash can. The second tier was redone, new icing was made…and I was extremely happy with the end result. The flowers were pre-made out of fondant and set out to dry and harden for easy handling putting on the cake, then I put a little dot of white icing inside each flower for color contrast. After looking at some other castle cakes, the vines going up the sides looked interesting as well. The water is made out of piping gel, and the little bridge was also made out of fondant that was set to dry. I cut an empty toilet paper roll in half to prop it up for 24 hours so it could dry completely and hold its form. I bought the package of princesses as toppers, and they also double as a present. She loves them. The flags are made out of fondant (also laid out to dry) and attached to skewers. The bottom tier of the cake is a 6 layer 14 inch Neapolitan cake…so it was chocolate, strawberry, and vanilla cakes layered twice for the total of six layers. The top tier ended up being a 4 layer 6 inch cinnamon cake. We took the leftover cake to her school this morning, and they were quite happy. Ahh, the dessert table. I decided to stick with three items this year to make it easier, and since the cake was so massive (it literally weighed 40 pounds), only three items worked out great. The other two items included sugar cookies cut in the shapes of hearts, crowns, and high heeled shoes, and of course some Oreo Truffles drizzled with pink chocolate instead of white chocolate. The sugar cookies and truffles disappeared during the party, leaving only a couple of tiny little survivors on the table. I’m not really all that big into decorating for parties, other than using the basics, so that’s how it was here. Table decorating kit, a couple of table cloths, and balloons. Oh, and the piñata. Overall, it was a great turnout and the kids seemed to have a blast.